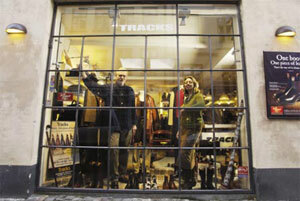 For more than 10 years Tracks has supplied Copenhagen, and its many visitors, with classic casual clothing. Although specialised in Austrailian labels like R.M. Williams they have an increasing range of European country casuals - corduroys, moleskins, tweeds, lambswool, wax jackets and benchmade shoes. Everything selected from a city perspective.